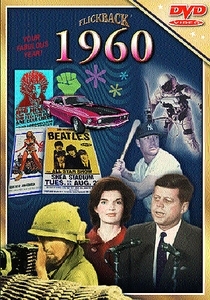 1960 DVD. 55th or Anniversary Present. For the most pleasing of 55th birthday gifts, which is also the most brilliant of 55th wedding anniversary gifts, give our 1960 DVD! It will distinctly demonstrate your warmth for your exceptional somebody and twosome! What more beloved 55th birthday idea than to show your regard in the world that helped mold the individual for whom you bear so much appreciation? And no more beloved 55th anniversary idea then to bring them back to that exceptional day and first year of marriage with the happenings portrayed (actual footage included!) in our 1960 DVD. Recapture the high spots of the year that were the high points of their life - their birth and their anniversary! Help them recollect that important time by giving this most impressive of 55th birthday gifts AND most coveted of 55th Anniversary gifts. Other 55th birthday ideas, which you will be able to use for extraordinary 55th anniversary ideas are, play the DVD at a party! Allow your guests to impart their own retrospections of that time! Contrast the style in which news was recounted and what was recounted then and now! Begin a conversation regarding whether times actually do change and if those were the good old days! Order this 1960 DVD today! Runs 30 minutes. See our other 55th birthday gifts. See also our 55th wedding anniversary gifts.